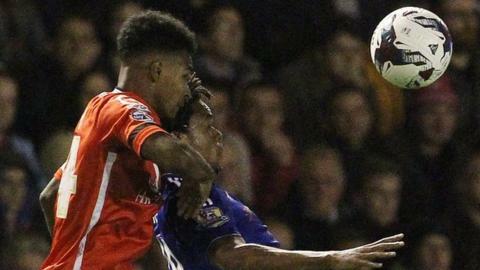 Walsall's highly-rated teenage defender Rico Henry has signed an extended three-year contract with the promotion-chasing League One club. Henry, 18, who only finalised his last deal in April, is now tied to the Saddlers until June 2018. "It's really good news for us," said Walsall boss Dean Smith. "We felt he'd earned the right to a new contract. "He's been a good young player for us and hopefully he can continue his fine development," added Smith. Henry, who made his debut in a Johnstone's Paint Trophy win at Tranmere on penalties in December 2014, has made 21 appearances. Meanwhile, Jason Demetriou and Neil Etheridge will both miss second-placed Walsall's potential top-of-the-table clash with current leaders Burton Albion on Saturday week because of international commitments. Demetriou has once again been called up by Cyprus for their final two Euro 2016 qualifying games against Israel (10 October) and Bosnia/Herzegovina (13 October). Etheridge is needed by the Philippines for the 2018 World Cup qualifiers against the DPR Korea in Pyongyang (8 October) and Bahrain in Manama (13 October). Walsall are away from home this Saturday, at ninth-placed Wigan Athletic, where the Saddlers will hope to extend their unbeaten League One away record to six games.